I’ll admit that the art of kumiko is not for everyone. It’s the intricate angles on each individual piece, strategically placed, that make the assembly delicate and geometrically enticing. This table just looks gorgeous. The kumiko pattern is done so well that it’s almost like an optical illusion for me. My eyes just get stuck trying to see through it. Take a look at this massive restoration project. After watching this video, you cannot help but to wonder how wooden ships were built without power tools. I can’t anyway. A true craftsman era. A useful insight to Bandsaw Boxes. Kenny gives tips all the way through especially early on regarding how and where to start your cut that gives a better glue line on reconstruction. Video is nearly 30 minutes but very well presented and interesting. A handy video for cutting your own wooden T-Track. 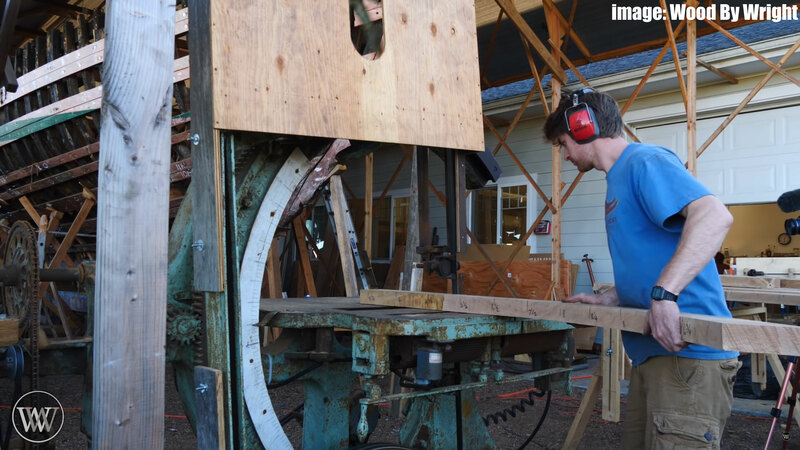 Eric shows a neat jig to convert your router into a tenon jig. I’m a little concerned with the stability of the platform but I love his outlook and creative thinking. He said in a comment on the video “As always, this add-on / jig is by no means perfect or complete. I always end up making a few tweaks after using it a few times. I built this, factoring-in weight, storage, ease of set-up and overall ease of use.” That’s a great mentality to have. So many people don’t get anything done for fear of messing up or failing. Continuous improvement is evident in his shop. Good stuff. I saw this video and was thinking…just a plywood box, right? Well yeah…but there’s more to it than that. It’s a simple box that ended up being pretty creative. A box that looks like a gift package. This would be a pretty neat gift by itself for a kid to enjoy. Creative work with the ribbon as well. This is a short inspirational video about the way woodworking changes lives. Great story on Blue Ox. I really enjoyed watching that. Thank you for the upload. Thanks for the Tally Ho vid – worth watching Leo’s vids as well. Think is up to about 28 of them. I’ve seen most of these but almost missed a few until I remembered how you look-out for the WW community with this service you provide. With everything else youy do, it’s a wonder you find the time to collect these and put together a YT video with some very good providers in it. Thank you brother for your dedication, craftsmanship and commitment to the community. Thanks for the kind words, Eric. I’ve got a team of 3 people working with me to find these interesting links. It really narrows down the time needed for me to put together one of these articles. I had the same thought on boat restoration. How did they build boats back in the day. liked the bandsaw box. have to make one of those. Really great article, thanks for sharing this. The videos were a joy to watch.